There is a consensus that smallholder farming needs to become more productive, more sustainable and more profitable. Unmanned Aerial Systems (UAS) – or drone-based systems – services can contribute towards these goals by bringing some of the tools of precision agriculture to producers, which include large and medium-scale holdings and associations of small-scale farmers growing the same crop in contiguous areas. Typically, UAS services are provided by entrepreneurs who invest in the equipment, learn the skills to use it, conduct or sub-contract data analysis, interpret the findings and advise their customers. UAS can inform a range of services, including mapping and surveying (e.g. farm boundary delineations, crop area calculations, elaboration of digital elevation models), crop inventory (e.g. count of tree crops, yield estimations), crop scouting (e.g. identification of location-specific crop stress, assessment of biomass development), crop damage assessment (e.g. for insurance purposes), crop management advice (e.g. nitrogen application on selected crops), infrastructure inspection (e.g. irrigation systems, farm to market roads, etc. ), and increasing farmers’ credit-worthiness via the integration of farmer profiles with high resolution images, crop diagnostics, and accurate and up-to-date georeferenced data sets. UAS can thus help increase returns to farmers and create new knowledge -intensive employment opportunities in rural areas, offering educated rural youth an alternative to migration. In support of drones on 26 January 2018, issuing a Decision EX.CL/Dec. 986-1007 (XXXII), the Executive Council of the African Union (AU), requested the AU and Member States to harness drones for agriculture as a selected emerging technology of relevance for the development of the African continent. The full report “Drones on the Horizon: Transforming Africa’s Agriculture” (Des Drones à l’ Horizon – Transformer L ‘Agriculture En Afrique”) has been launched by the African Union (AU) High Level Panel on Emerging Technologies (APET) at the Africa Innovation Summit 2018 on June 8, 2018 in Kigali, Rwanda. In this context, CTA has launched a new project focusing on Sub-Saharan Africa, known as “Transforming African agriculture: Eyes in the Sky, Smart Techs on the Ground”. A total of 18 enterprises / organisations from Malawi, Benin, Burkina Faso, Cameroon, Ghana, Kenya, Angola, Nigeria, and Senegal have been selected after a call and offered co-funding for acquiring equipment and analytical software, training, coaching, capacity building in terms of business development, and networking opportunities. CTA will also put UAS operators in touch with potential clients, such asagribusinesses and farmer organisations growing the same crop in contiguous areas or engaged in crop intensification. UAS operators (12) benefitting from CTA support obtained in previous phases, are going to be involved in this project as well. The application process was very competitive and LEAD presented a case based on the BRECcIA research project as an opportunity for utilizing the drone for research for African food and water security. This is the main reason why LEAD proposal was among the successful ones. Limited availability of real-time, location-specific, high-resolution, actionable data supporting farmers in their decision-making processes. Lack of robust (scientific) evidence of actual returns to investment for African farmers paying for UAS-based advice. Lack of available information on the UAS technology. Lack of rewarding job opportunities for educated youth. to determine and document if smallholder farmers, increase crop yield and farm income by acting upon advice based on UAS-based diagnostics. To build a body of evidence concerning the benefits deriving from the use of UAS in the agricultural sector (including credit-worthiness of farmers) and share related information as widely as possible. –The purpose of the training workshop in Zambia, was to build capacity among African enterprises in making effective and responsible use of Unmanned Aerial Systems (UAS) and to equip participants with the needed theoretical and practical knowledge to fully and responsibly utilize such systems and market their services. 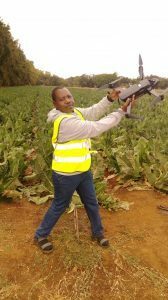 On-field research activities aimed at determining the cost and benefits resulting to farmers from taking actions based on UAS-generated advice, will be launched in Malawi in partnership with BRECcIA research project with possibility of scaling out to Kenya and Ghana. Additional research activities will be integrated into the small projects planned by PDRAs and other research assistants within BRECcIA. It is anticipated the expertise across the BRECcIA project will be harnessed tol provide technical support in terms of further training courses through short meetings, coaching and mentoring in order to use the technology for responding to some of the BRECcIA research questions. 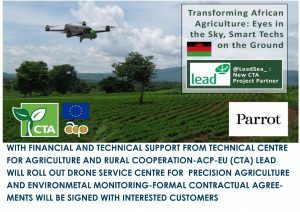 LEAD will also plan to provide drone services in Malawi for research, crop monitoring, water resource management and humanitarian. This entry was posted in UAV and tagged drone, malawi, UAV, workshop on 12th September 2018.